It’s been 10 years since Dianna Payne found running. It’s a relationship still going strong – one she gives credit to many factors, including her participation in her first race – the 2007 Emera Marathon By The Sea. Natalie Davidson, right, ran her first half marathon at Marathon By The Sea in 2003. Natalie Davison is originally from Moncton but now calls the far north of Queensland, Australia home. She moved there in 2008 after graduating from Dalhousie University with a physiotherapy degree. Originally, the trip was thought to be a six-month holiday but she quickly fell in love with the country and never left. However, she is returning to New Brunswick to compete in the half marathon in the 2016 Emera Marathon By The Sea. Brenda Guitard is shown here in the 2013 Boston Marathon, turning onto Bolyston Street toward the finish line. Many people in the Saint John running community will recognize the person we have profiled – Brenda Guitard. Originally, we asked a few questions and Brenda suggested we weave them into a story. But she’s done such an awesome job of detailing her career, her words are perfect. Here is today’s Running Whys for the Marathon by the Sea, which takes place Aug 12-14 in Saint John. Const. 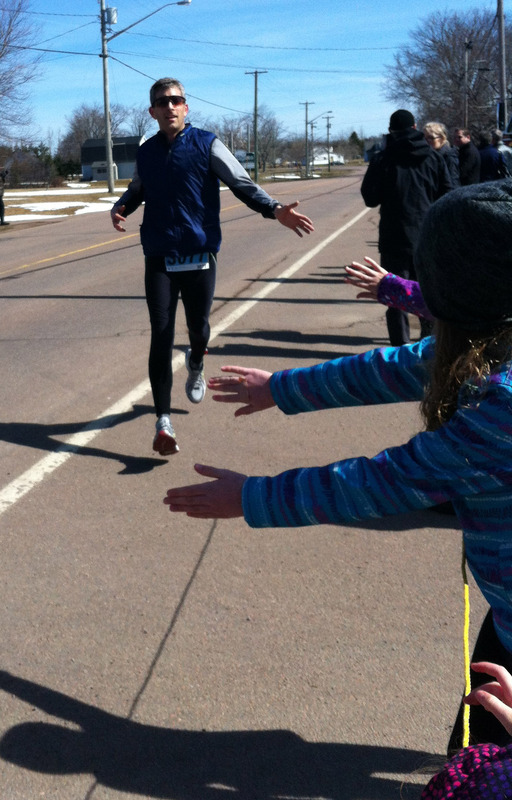 Doug Larche reaches to high five his daughters near the end of a 15 km race in 2014. It had developed into a Sunday tradition at Nadine Larche’s mother’s house.